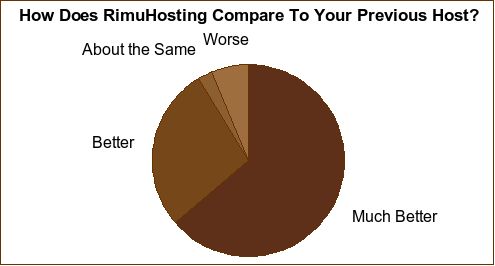 RimuHosting marked its fifth anniversary of hosting with a survey of customers. The survey was completed by current customers as well as customers who had hosted with us at some point in the last few years. We had 107 responses to the survey at the time of writing, five days after the survey was created. We asked if customers were hosting a domain on their server with us. It came as no surprise to hear that is what 90% of our customers are doing. dlevitan.com - A personal website being run on Drupal with a mysql backend. I also run a webmail interface using Roundcubemail (also with mysql storage). A commercial site built on Struts, Tomcat, Apache & MySQL, providing music theory training drills (Java applets). Teachers subscribe to be able to give student assignments with pre-chosen settings, monitor scores, etc. The drills themselves are free to access, and most of my traffic comes from folks using them. Hotspotr - a community-driven directory of WiFi hotspots. It currently lists 8,000+ hotspots. The server has handled being dugg a few times, which entails 25-40K page views over a five or six hours. allyourgreen.com - a retail site offering a variety of green and ecologically friendly products. Recycled bags, reusable water bottles, natural soaps, and more. www.energylens.com - a site for selling a software product for helping businesses to save energy. It is mainly aimed at professionals in the energy-saving industry. They are also using their VPS to host a number of other commercial sites aimed at the same niche market. friendlybookings.com - Bookings and payments for amateur theatres. sharedcopy.com - a free online annotation service. Registration is optional, users use their webapp and markup webpages for collaboration, sharing or personal bookmarking. A Ruby on Rails web developer building and hosting websites for small business. Currently with around 25 hosted client sites. ratemyplacement.co.uk - a commercial startup, just marking it's first year's birthday today actually! (see http://www.ratemyplacement.co.uk/articles/1st-birthday/). It recently got to the finals of the HSBC Unipreneurs competition, and they are waiting to see if they will win the ? ?20,000 business prize. The site is the UK's first industrial placement rating website for students, and it's garnered some great press in the UK - in the Times, Financial Times and the Guardian newspapers amongst others. Not bad for a one year old student start up. govtrack.us - GovTrack is in some ways the pioneer of open data for the U.S. Congress. It's both a front-end to help people track legislation as well as a data-gathering back end that produces the only open database of the status of federal legislation, which is in use at a bunch of other websites. The site is noncommercial. The site is fairly popular with about 15k visitors per day. We asked how customers were using their server for things other than their website. 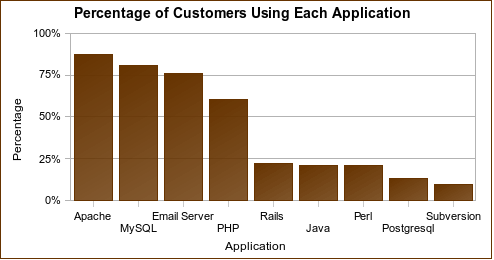 Email is a popular use of the server. Customers have a variety of setups. Some use spam filtering software or anti-virus software. Some have a few email accounts, others host email for large groups (e.g. employees, or website users). Our customers also use their servers for development. The developers deploying applications for testing. They run source code repository software like subversion, mercurial, git or CVS. Customers set up bug tracking software like Trac. Some customers use their server with as as a utility server. These kinds of uses include: offsite filestore/backup (e.g. to backup their PC). Or as a general Unix playground they can ssh into and play around with. EVERYTHING! I love my vps. I have a mesh of OpenVPN mesh tunnels terminated and routed on my VPS because of Rimu's great uptime. I run an Asterisk VoIP server trunked to Gizmo for cheap outbound phone calls (and free tollfree calls). I have a Callweaver VoIP service terminating a T.38 trunk so I can receive inbound faxes and convert to PDF. I have PHP/Apache/MySQL stack for standard web development. SVN for version control. I have Big Brother for monitoring other VPSs and servers through those OpenVPN tunnels. I also have a private jabber server running so me and my other buddies on the openvpn network can chat securely without going 'online'. And last, but not least, I have a squid proxy so I can play my online games from work (sshhh ;-)) and SSH for SOCKS proxying. Job well done little-rimu-vps-engine-that could! Python script to periodically monitor and record data coming from another server. I'm an Engineering Fellow with Honeywell. I use my VPS to understand, explore, and experiment with interesting technologies. Your forward looking and service oriented approach makes it very easy for me to do that. Its other main purpose is as a mail server. Specifically, postfix, amavis, clamd, and spamassassin on the SMTP side and perdition/dovecot on the IMAP side (I need perdition for an alternate server that stores the mail for some of the accounts). A big feature of the application is to send emails from the system and between members. I really appreciated the pristine mail setup that came out of the box with the distro I chose. I am a unix geek, but this doesn't mean I enjoy setting up DNS, Sendmail or anything else like that. The webmin control panel is comprehensive and excellent. It's great to have such a nice service, and virtual hosting rocks. I just want to get things done, and having my own (virtual) box is just the ticket. Yes. You did your best to implement all the special features I asked for and, more importantly, helped me to understand the practical ramifications of my request. And finally you did it in away that I could learn from and repeat myself. As a result I've be able to provide a much more informed perspective when involved in web related discussions and projects. I installed most of the software, but without Peter and several others, some of the details would have been difficult for me to guess. I'm a developer but not a sysadmin. We set up our own site but have, on several occasions, relied on the Rimu staff to assist us with more technical issues. Yes and you guys are unbelievable. I will recommend anyone hosting java to come here since the other guys give you a blank pad and send you on your way. Back in 1994, I got my first ISP, and back then, they actually had people who had a clue. Since then, not so much. But RimuHosting's support team is amazing. I got a thoughtful response to my initial sales questions from an actual engineer with actual technical skills. I have had several cases where I got stuck on a problem and in minutes, someone had looked at the problem, resolved it for me, and also provided useful advice. It will be hard to maintain this level of quality as you grow, but if you can, it will entirely distinguish your service and provide a level of differentiation that I would, without question, pay much more for. There have to be a lot of people like me out there: know most of what you need to know to host a site, but not everything. It gives me great confidence to know that someone there knows what I don't. They helped and i can say they are very good! That's the main reason i changed of hosting and for it i am thinking to stay here for a looong time. Expecially Felicisimo helped a lot. He have good skills and educated when dealling with customers. The help i got was to uninstall my postgres attempt of installation, some directions of how to use Apache (mod_rewrite) and a fix with a little mistake of mine when dealing dovecot. Your support guys have been sensational, they setup up my SVN and Trac installations perfectly and just as I requested (even though I changed my mind and setup several times! ), they setup Rails for me and also helped me when I has some questions about SFTP and Apache. You helped incredibly...setting up the IP ban that blocked all the attacks from Russia and did (and continue) to help a terminal-phobic Mac user like me. No question seems to big for you guys to help with! Support has been awsome! Great Linux Experts! They installed JBoss, and MySQL for me, and helped resolving many issues. We asked our customers what they do in their 'regular' nine to five job. 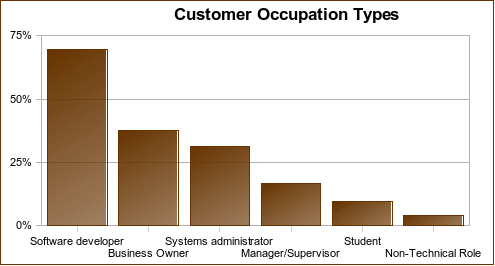 Most of our customers (96%) have a 'technical' (computer related) occupation. And the most common occupation is software developer (70%). Many of our customers (38%) run their own business. And for many their server with us is the public face of that business. 75% of our customers are in the 25-45 age bracket. About 10% are students. RimuHosting has always catered to the 'geek' hosting market. Most of our users are comfortable on the command like. Faced with a problem they are quite likely to initially try to research a solution and resolve things themselves. The RimuHosting support team is always on standby to help out when needed. Consequently we tend not to host too many Mom-and-pop businesses. Nor do we have too many customers that just needs a few static HTML pages and a web based control panel to manage that site. We asked our customers where they had first found out about RimuHosting. 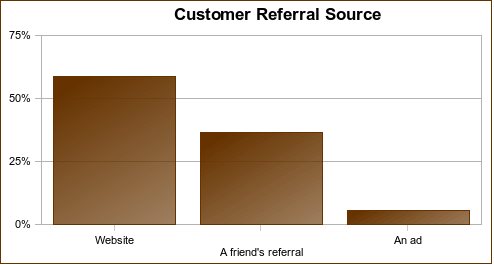 Most heard of us via a link from someone elses site (often a customer of ours mentioning their experience hosting with us) or from a friend's referral. A tiny percentage also discovered us via an ad (we mainly advertise through google adwords). It is great for us to see that positive word of mouth is helping to drive our growth. One of the things the staff at RimuHosting work really hard at is trying to provide support and service that will delight our customers. Our goal is to not just make them happy, but actually surprise them with unexpectedly good service. Over the years we have received some very kind comments from customers. We love to receive these emails and notes. And many of the comments are posted on our testimonials page. 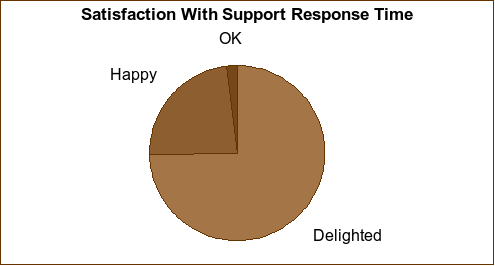 In the survey we asked our customers (and ex-customers) "How happy are you with RimuHosting's Support Responses (Helpful, Friendly, Professional)". Amazingly 84% of customers were not just happy, but actually delighted with our support. Stunningly just 1% thought we were merely 'OK' and 0% (not a single unhappy respondent of the 102 responses to that question at the time of writing) rated our support 'Poor'. Over the last 12 months we have doubled the size of our support team. And we have strengthened the round the clock coverage we provide. 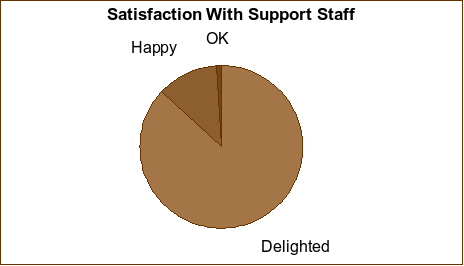 Consequently, 95% of our customers are happy or delighted with the time it takes us to respond to support requests. 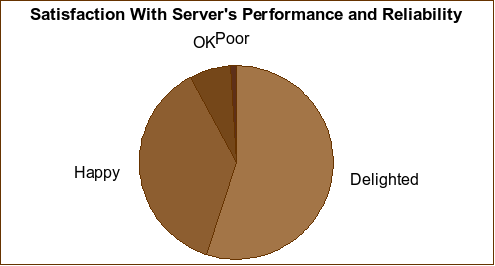 We asked our customers how satisfied they were with their server's performance and reliability. Virtually everyone was more than happy with what they had been receiving. That said we are always working to improve the reliability of our servers (e.g. with improved hardware and Xen software) as well as performance (via server load monitoring scripts and followups with customers). We asked our customers how our hosting compared to a previous host (if they had come to us from some other hosting provider). 91% of our current and ex-customers rated our hosting better than their previous host. Support is a big difference, at RimuHosting you ask a question and you get a quick response with help and suggestions with my prior hosting company when I asked a question they took it as if I was attacking and didn't have a good answer anyway. Flexibility, responsiveness, candor, technical competence, cost, etc.. I'm going to make this comparison against other hosting providers I interact with for my work. To me, your support is your main asset. You have knowledgeable and kind people who respond quickly. The most important difference is that I end up communicating with human beings who are knowledgeable and willing to accommodate. Shell access. root access (hallelujah!). Ability to have multiple IPs. knowledgeable, and obviously sysadmins themselves, support staff. On my VPS, I've had to do much more work myself getting it set up, tweaking MySQL/Apache/Tomcat/etc. for my usage, and so on -- which has been a lot of work, but it's much more solid now, and I have much more control when something does go wrong (the support is also better). Your price is a little higher but you really do get what you pay for. My old hosting company was BRUTAL at customer service and for me and my company that is critical. Rimu is more stable. No one restart my tomcat or mess with my databank permissions (old problems on old hosting). Rimu have good hardware capabiblities: good processors, good bandwith (too few ram memories) Have a price that I consider OK for my needs. The two main differences are the technical knowledge and the response times: you are on another planet in comparison with other poor perform[ing hosts]. Personally, you are "shell guys" and so am I. And I'm a developer who likes opensource, and you like it too. With the other hosting company, I always had the distinct impression that they were busy playing some computer game like half-life all day long - and whenever a support query came in they had to abandon the game and give you the most curt and cryptic answer possible - so they could get on with the game. They always responded almost immediately - but the answers were mostly useless. Was using (and still am using) [some other host]. Their bandwidth and disk space promises are far higher but 1) none of our sites use anywhere near that much and 2) I've heard that before you get anywhere near the supposed limits of your account they'll find some reason to boot you off. It's also unusably slow a lot of the time. You guys are better in pretty much every imaginable facet. Extremely responsive service staff. When I email Rimu, the request goes straight to someone who understands the system - not to a first level "filter" employee who reads from a website and passes the buck. Support at RimuHosting is second to none. I never have a lingering feeling wondering what is going on or if someone is going to help. I used one of the early virtualization hosts (using virtuozzo) and it seemed bogus to me, to be honest. From a developer's perspective, if you want to focus on your code and not so much on constant system configuration issues, the support is invaluable. Even though there are less expensive alternatives, the support more than makes up for the price. I don't think I would recommend you to mom and pop who want to put their doll store online. I don't think they'd know where to begin with you, and I don't think you want them as a customer. But to my nerdy geeky friends, I'd say that rimuhosting is a hosting provider that seems to be honest, run be very knowledgeable people, with quite an amazing support desk, that shows you the number of seconds gone by since you submitted your request. Honest folks/company, well knowledgeable, fair pricing, fast servers. more like a partner in your business rather than just a provider of server space. These guys are the best. Complete root access, great up-times, the best support staff around. Everyone is always sold on the support part. Solid VPS hosting, fairly priced with excellent support; growing very fast but seems to be keeping on top of it for now; if you're ready to DIY, this is probably the place to go. The best hosting service if you want root access at a cheap price. One of the best hosting companies that we've dealt with. For a non-technical person, Rimu provides the kind of attentive problem resolution that we need. The perfect host for the do-it-yourself geek. Definitely great for those who know what they want. Absolute must - don't think about anybody else. A place to get a real server to do a real application with great support and without any hassle and for a very reasonable price. Flexible packages, good prices, and truly excellent support, although you will need to know what you're doing to make use of it. I would use any technique possible to sell you to them, because as far as I'm concerned now there are no alternatives. But if I had to highlight a particular feature that stands out above the rest, it would be your support guys, I cannot say enough about them or give them enough praise! I say that you are a very small-company-friendly, hosting company that provide VPS at the same sort of price as others do shared hosting. I also say that your support is brilliant. And it matters that the support is handled by a team with names. Good support and stable, leaving me confident that I won't end up with a pile of stress one day when things go wrong. It is one of the best commercial service sites I've had to deal with and the people have their act together and provide good value for the money. Reliable, knowledgeable, personable and helpful. A rare collection of geeks with interpersonal skills and good attitudes. The servers stay up pretty well and nothing is too much trouble - you get at least what you pay for, and often a whole lot more. They provide a slice of a server's power to you, and give it to you in a way that it's like you have your own dedicated server you can do pretty much anything you want with. You do all your own patching, configuration, and support. But the really nice thing about them is that they have a really good staff for support, so if you get yourself in a jam, they are there. If something goes wrong, they know what you're talking about instead of having to explain it to a call-center jockey who just does data entry. Best support I've ever had ... and prices that are unbeatable for the quality of service. Wonderfully helpful and polite. Good VPS-to-customer ratio. I never feel like my VPS is limping. Knowledgeable and friendly staff. Support, honesty, and being real humans. Your customer service is awesome. Don't ever lose that as your company grows. When there are problems, you keep the maintenance notices page updated often. Too much info is way better than too little info. I don't mind breakdowns. But I _hate_ not knowing what's happening during a breakdown. Great support that doesn't look for reasons why its not your problem. A good service with data center in Europe. Almost everything. The quick setup of new servers and speedy replies to support questions. Way your support team works (nice and easy conversation, smooth problem fixing) and way you maintain your hardware (fast replace, everything is displayed, so you know which servers have problems now and you may see if your is in, when it started and when it will be over). Awesome support, friendly staff that doesn't even give you a hard time when you make a stupid mistake. Hosts seem reliable. Support is "to die for" - I quote and endorse that comment from the mailing list that lead me here. Unix-ness of it all - it's difficult, but it's totally customizable. It's my own rack mounted server basically. I don't often require tech support, but I'm really glad it's there. The server is currently pretty quick, and that is essential to me. Keep up on hiring staff that knows what they do really well; Be it linux, networking, programming, or whatever. It's what keeps me here, and what causes me to send others your way. Develop a new and more modern website. If you want my honest opinion, your product and service are not being showcased to their full potential. Your website is just like a Dinosaur. You need a good website that will automate most of the support process. Improve access times to disk. The other awesome thing would be some form of CVS, git or SVN that would allow me to check config files in and out - that would be a real killer service! I think you can reinforce the message that your techs and tools can "fill in the blanks" to help take the hassle and aggravation (and time) out of setting up a site. "You know most of what you need to build a website, but when you need someone to ask for sysadmin help, our techs are there". Communicate opportunities to upgrade server specs. It would also be great to hear more stories and blog-type posts from your staff. These are all great ideas. And some of the requests are already in our pipeline to implement. Expect to hear more from us about them soon.